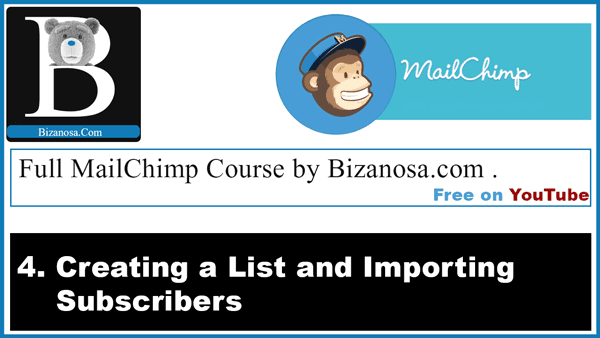 Hi and welcome back to this MailChimp course by Ricky Wahowa, for Bizanosa.com. Today I want us to look at Lists in Mailchimp . This is where the emails for your subscribers are . You can create different lists. A list is , yes, a list of emails and names plus other details of your subscribers. In MailChimp if you don’t have a paid plan, the subscriber list is limited to 2000 subscribers only. You can create different lists to collect different types of subscribers. For example, you can create a list for subscribers who opted in from your blog posts. And you can also create a list of subscribers who opted in from a link you shared on Social Media. You cam also create a list of subscribers who signed up for an event online. Then go to CREATE A LIST . Give the list a name . Input your Default from Email where people can reply to . Default from name. What do you want people to see as the sender for all campaigns / email newsletters. Remind people how they got on your list . You can tell them why they are receiving the email .Remind them where they gave you their email. Company / Organization. You can add your Company details here. The reasoning here is that, since you can create different lists, you probably have different lists for your different businesses. Choose notification settings. You can change the email where notifications will be sent. . Then you will choose the notification type that you prefer . Daily Summary : Sends you a daily summary of your new subscribers and any unsubscribers. One by one (subscribe) : get notifications in real time as the new subscribers join our list. One by one (unsubscribe) : get notifications in real time as the new subscribers leave your list. The first option of Daily Summary is recommended. One by one, as it happens is not advisable if you don’t like distractions due to email. One by one unsubscribe notifications as they happen . Both one by one will always have to go together because you will want to know if someone subscribed and also want to know if someone unsubscribed . After all the settings and Information for your MailChimp list has been filled. Click Save. So we have a list, what next ? You have no subscribers. So there are different ways of adding a mailchimp subscriber . If you want to add subscribers, click on Add Subscribers . In the next window you will be able to import subscribers. You will see which options are supported in the MailChimp Import subscribers window. You can also import from SalesForce, Highrise, atchbook, Zendesk, SurveyGizmo and a bunch of other platforms . So if you already have subscribers in any of these places you can import them to MailChimp. When you click on Import from CSV or TXT File, the upload window comes next. Browse for your CSV or txt file . Then choose, Import email Addresses as Subscribers . Because it is a new list you are creating . Then click on Upload List. If all is successful you will see a highlight telling you the number of subscribers imported. Eg, 6 emails subscribed to your list. You will then see the list of all emails imported on your Mailchimp lists page. We have successfully imported a mailchimp email list from a TXT file . Later (Next ) we’ll see how we can edit and add fields in for the MailChimp list of subscribers. See you in the next Video/post .